Meet Daisy. 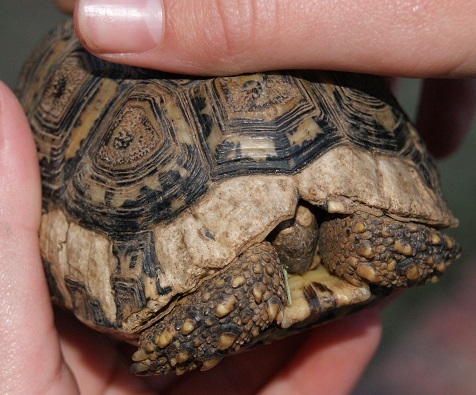 Not a friendly jersey cow, but an Angulate Tortoise (Chersina angulata). C christened it that as soon as she saw it. Daisy crossed paths with us a couple of weeks ago when, while P was out walking, a passerby asked if he could borrow a knife. Who carries a knife when out walking with the intention of enjoying the fresh air and exercise? A walking stick perhaps to ward off the odd over-zealous dog, but not a knife! The chap indicated a small tortoise clasped in his hand and said he wished to remove the body from its shell in order to eat it. Feeling horrified at the thought, P gave him some cash instead and released Daisy in our sprawling garden. We have discovered that it covers a wide area in the course of a day and can make a quick get away when it wants to. I can attest that it retreats for cover when the sun gets hot for I found it difficult to keep Daisy in the field of my lens while photographing it. 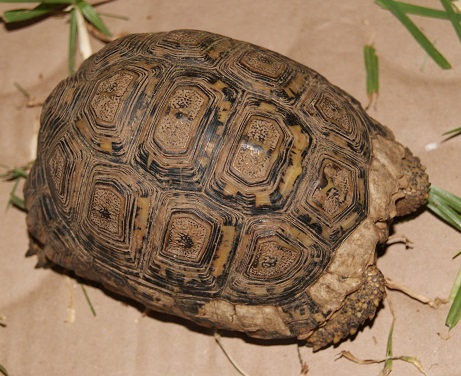 This is one tortoise that could give the average hare a run for its money! 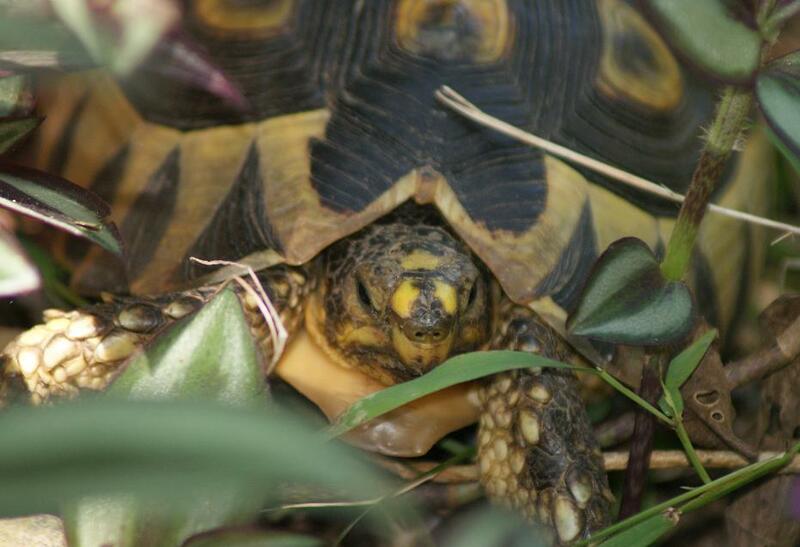 Angulate Tortoises eat grasses and succulents so Daisy has plenty to choose from in the garden and is welcome to chomp its way through the masses of Tradescantia (Wandering Jew) growing all over. I was interested to read in Bill Branch’s Field Guide to the Snakes and other Reptiles of southern Africa that Angulate Tortoises drink water through their noses! 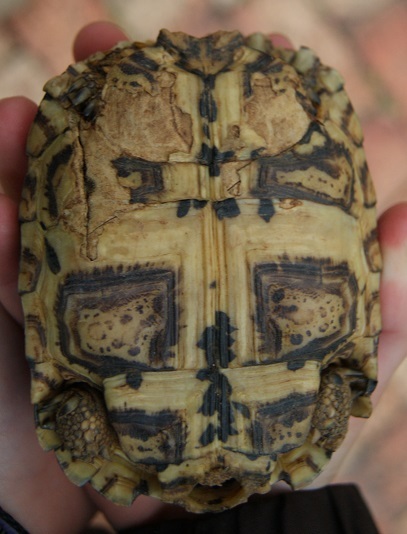 These tortoises typically have a single gular shield below the head – I had to look that one up too: it means a chin shield. Daisy has the run of the garden and appears to be content for now. 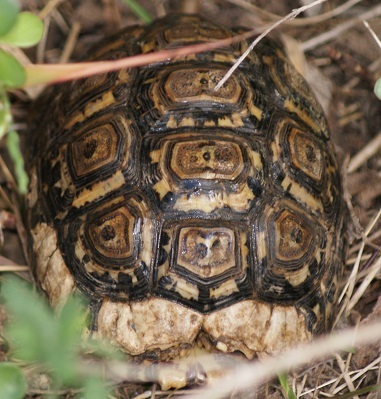 Last year a large Leopard Tortoise (Geochelone pardalis) took up residence in our garden for a couple of weeks, disappearing as mysteriously as it had arrived. We’ll have to see how long Daisy stays for.